Looking for more on Big Up’s latest movie Progression and Chris Sharma’s Jumbo Love? Check out these posts! Chris returned to the States this summer fitter than ever and with full focus on the Clark Mountain project. About ten days ago he had a breakthrough attempt, getting a few moves below the lip of the cave. He called us to let us know he was close, and B and Coop flew out to try and catch the send. Last week it hit 100 degrees in Vegas, and conditions were not ideal for limit climbing, but on Thursday, 9/11 it all came together, he owned every hold, did every sequence exactly right, and topped out his hardest, proudest route. No mention of a grade or name right now, but this route is clearly a contender for one of the hardest routes in the U.S. You have to give a lot of credit to Randy Leavitt for having the vision to bolt this route over 10 years ago! Back in June of 2007, a futuristic project at Clark Mt. was mentioned in Ethan Pringle’s blog. 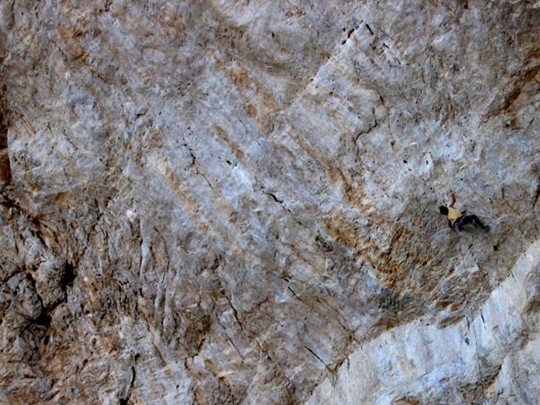 Later in June of 2007, Mike Call mentioned that he had been helping film this new route, calling it “one of the most impressive chunks of rock I’ve ever seen”. Then in July of 2007, I had some background on the climbing at Clark Mt. and how it all got started. And finally, late in 2007 Ethan Pringle and Dave Graham ventured out to Clark Mt. to give the project a try. Ethan’s efforts in particular helped remove some of the mystique surrounding the route as he was able to quickly make some significant links on the route. You can see footage of them working the route in the archives at MVM. I’m sure we can look foward to seeing the footage of Sharma climbing this route in an upcoming release from Big Up, stay tuned to find out when that happens.